The Olympic Wanderrings puzzle consists of a base with 5 pegs, and 25 rings that fit onto the pegs. The pegs are arranged and coloured just like the olympic rings logo, i.e. in a W formation with the colours blue, yellow, black, green, and red. 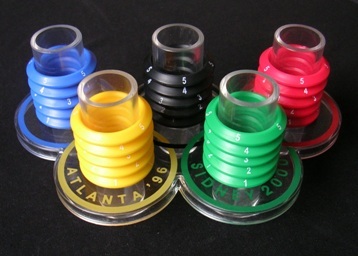 Of each colour there are five rings, numbered 1 to 5. The rules of the puzzle are that you are only allowed to move exactly two or three rings as a unit (i.e. without changing their order) from one ring to another, and that a peg cannot hold more than 7 rings at a time. You start with a randomly mixed arrangement, and move two or three rings at a time to reached the solved position, in which each peg contains all the rings of the same colour, arranged in numerical order with 1 at the base and 5 on top. This puzzle is somewhat related to the Towers of Hanoi. There are 926 ways to distribute 25 identical rings over 5 pegs such that each peg has at most 7 rings. There is no easy closed formula to count those arrangements, but there is a recurrence relation you could solve, or you can count all the arrangements directly. For each of those 926 arrangements the 25 rings can be ordered in 25! ways. This gives a total of 926·25! = 14,363,380,500,124,493,021,184,000,000, or about 1.4·1028 positions. Jim Storer's site had a page here, with a solution hints and pictures of the booklet. This puzzle is not difficult to solve, but it is quite hard to explain in detail how to solve it. I will therefore only give some general guidelines and hints. Move two rings from any other peg to the first peg on top of the ring you want to move. Move three rings from the first peg to the second peg, thus moving the ring you want to move. Move the top two rings from the second peg back where they came from. It is best to solve the puzzle peg by peg, i.e. fully solve one colour before moving on to the next. This works better than solving the puzzle number by number. When solving the fifth ring on a peg, you must never put ring 5 in place by moving two rings at once (i.e. ring 5 and another above it). That would leave a single ring on top of the five solved rings, and that single ring cannot be removed without disturbing the solved rings. Instead, put ring 5 in place by moving 3 at a time (the 5 with two more rings on top), so that the surplus rings can be removed easily. If the opportunity arises, you may instead put rings 4 and 5 in place at the same time, or maybe even 3, 4, and 5 all at once. Just make sure that when solving ring 5, you leave zero or two surplus rings on that peg, but never just one. Remember to utilise the space above the solved pegs. You can put pairs of surplus pieces there when you are making space on the peg you are solving. When you have solved three pegs, it helps to move some pairs of pieces from one solved peg onto the other solved pegs in order to create some more room to manoeuvre. Once the final pegs have been solved, you can move those displaced pairs back where they belong. There is not enough free space to move a ring directly from the bottom of one peg to the bottom of another peg. If you have a ring 1 at the bottom of a peg of another colour, then you must first move it to a spot higher up on a third peg, and then arrange to move it into its correct position.